If you’ve ever wandered through downtown Victoria on a bustling summer day, you’re sure to have been witness to chalk art. Chalk art takes hopscotch to a whole new level, using the medium to create stunning illustrations in vibrant colours – some often in 3D. Victoria local John Vickers was struck with the idea for the Chalk Festival while watching an artist at work on Government Street. Soon after he traveled to Sarasota, Florida to visit the world’s largest festival, and the rest is history. He knew he wanted to bring this kind of festival to Victoria. “Like many new festivals, this is a 100% volunteer effort involving many people and partners behind the scenes. The community goal is to create a foundation in which to build upon going forward”, says Vickers. Victoria is excited to host its first-ever chalk festival next week at free, family-friendly events. Over five days, a number of renowned chalk artists will be displaying their talents in downtown Victoria. 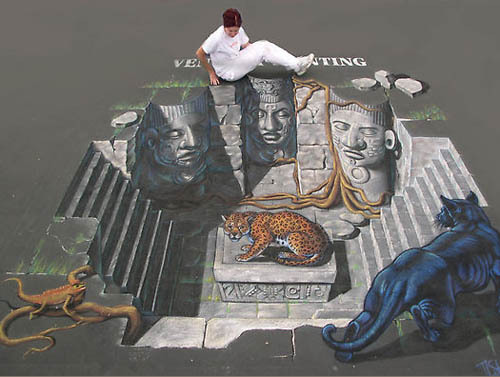 The culmination of the festival will be at The Bay Centre as Tracy Lee Strum creates a 20′ x 20′ 3D chalk art drawing. For more information, visit Victoria Chalk Festival online, on Facebook, or you can follow the latest updates on Twitter!